Author: Rabbi Chaim Kramer Description: A highly readable but scholarly history of Reb Noson's life and thought, with extensive historical background; appendixes. The author is director of the Breslov Research Institute of Jerusalem, which has published more than 100 titles in English and other languages. 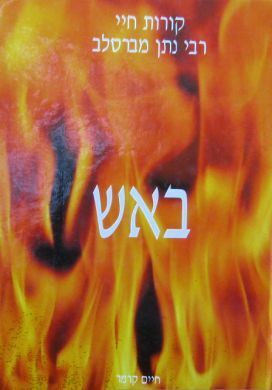 (This is the Hebrew version; also available in English as "Through Fire and Water.") Publication Data: Breslov Research Institute, Jerusalem. 688 pp., 9" x 6" HB, without nekudos.